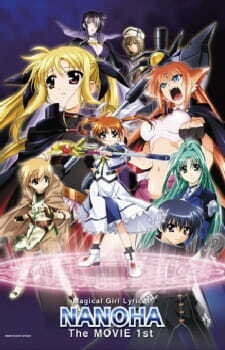 Mahou Shoujo Lyrical Nanoha: The Movie 1st is the recap movie of everything that happened in the first TV series with the introduction of new battle animation and transformation sequences. Mahou Shoujo Lyrical Nanoha: The Movie 1st is basically the first season of the TV series mashed into one feature length movie with the addition of new battle animations and transformation sequences. If you have already watched the original TV series, you may already know what happens in the story. However, the story isn't all exactly the same as the series; the producers have added in some little extra content, some different perspectives and more rounded approach in making sure you still get entertained. They have done a good job in doing so and I felt that I wasn't bored at all. The art was improved this time around with highly detailed environments, more effects and imrpoved weapon design. Basically, all aspects of the art department have been upgraded. The characters still looked cute though, and the costumes have slightly changed. The sound has also been improved with the opening and closing theme songs being impressive as always. I've noticed some improvements in voice acting overall which was nice. Nothing to complain about here. The characters were essentially the same as the TV series. You might be put off by the childish appearance of the characters (and they are children to begin with), so it may take some time to actually get used to the anime. Other than that, the movie does well in accurately transposing the characters from the original TV series into the movie. Overall, I really have nothing else to add to this short review. There really isn't anything else to add on top of the review of the original TV series I made earlier. View this as Mahou Shoujo Lyrical Nanoha 2.0 where everything has been improved.